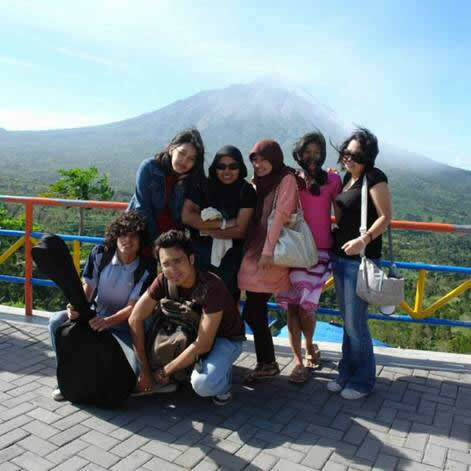 The year 2009 brought our group of 18 students along with 2 pathfinders to experience the artistically-rich and vibrant city of Yogyakarta, Indonesia. Over the span of 9 days, from 9th July to 17th July, the travellers were well-taken care of by 5 extremely warm and capable student guides of Universitas Gadjah Mada (UGM), an institution we visited for one of our scheduled sessions in this study trip. Characteristic of previous study trips, the travellers documented their experiences in a collective blog (http://insearchofyogyakarta.blogspot.com ) set up and managed by themselves. What was different about this year’s trip was the diverse backgrounds of the travellers who came together, hungry for fresh experiences in a foreign land. The trip brought together Monash University's Arts students from Australia, China, India, Indonesia, Malaysia and Singapore. In addition, two alumni members, Aron Raj and Eunice Phang also accompanied the travellers on this trip. Organized and planned by our pathfinder, Dr Yeoh Seng Guan, in consultation with a former traveller and Monash Arts graduate, Nurina Malinda, we embarked on a journey in the land of the arts. Our first session was a timely visit to the Centre for South East Asian Social Studies (CESASS), Universitas Gadjah Madar in light of the Indonesian presidential elections that had just taken place. Our host, Dr Aris Arif Mundayat, the director of CESASS, together with his colleague Mr Budi Irwanto, gave their analysis on the results of the elections and the nature of the political arena in Indonesia. After that the travellers adjourned to the office compound of INSIST (Indonesian Society for Social Transformation) situated about 18 kms to the north of the city. Gathering material for their blog article and diary entry. Student travellers interviewing the officers of HUMANA, an NGO working with street children. Jane, the leader of the video team, is recording the interview for a documentary. Here, Mr Roem Topatimasang, a committee member of INSIST, gave the travellers insights into the political economy of modern day agriculture and their experiments in encouraging self-sufficient agricultural production among rural farmers. Day 3 in Yogyakarta signalled our first foray at sightseeing. We were treated to the incredible views of Indonesia's active volcano, the famous Mount Merapi and other surrounding highlands from Ketep Pass. We then visited the Borobudur Buddhist temple, a UNESCO World Heritage site, and Parangtritis Beach, a site rich with myths and legends. Its high surging waves made swimming impossible in its clear waters. Day 4 was a day filled with what seemed like endless walking. First we walked to visit Kampung Kauman, a famous and old Muslim neighbourhood. Some of the travellers visited Kampung Kauman once again in the subsequent days to learn the art of batik-making from a resident master. From this neighbourhood, we trudged for an hour northwards along the banks of Kali Code (Code river) to meet up with one of the leaders of the many communities nested there. On Day 5, we visited Rifka Annisa, a women crisis center (WCC) catering to the needs of the female population as well as educating men on women's rights. The next session held at the artists’ commune of Taring Padi gave us an insight into the creativity of street political art in raising awareness about the freedom of expression and enlivening democracy in Indonesia. On Day 6, during our official sightseeing day, travellers ventured into the palace walls of the two-century old Kraton, the royal residence of the current Sri Sultan Hamengku Buwono X. The Kraton has an area that spans approximately 14,000 metres square. Later that day, we also visited the ancient Hindu temple of Prambanan. In the evening, the Prambanan towers served as a picturesque backdrop for the much awaited Ramayana Ballet that we watched. Day 7 marked the final official session attended by the travellers. It involved visiting street children supported by HUMANA. Travellers enjoyed (and tired) themselves playing a series of games with the children, and bringing them small gifts in the form of toys and candies. For the final two days of our stay in Yogyakarta, travellers shopped vigorously for souvenirs and gifts for their families and friends back home. It proved to be an interesting experience for all as everyone learnt quickly the art of bargaining and negotiating gracefully with vendors. The trip to Yogyakarta has been one replete with experiences of the stunning landscapes, vivid batik art-forms, and warm welcomes that we have received from the people whom we met in Yogyakarta. It has provided us a window into appreciating the Javanese way of life.